Atlantahaus Rottweilers proud to be one of the top German Rottweiler showing and working kennels in the United States, and one of the few kennels that other show and working kennels purchase their dogs from! We are second generation rottweiler breeders, having followed my fathers 25 years of breeding and showing, and adding the past 15 years myself. Combined, the rottweiler breed has been our family’s passionate hobby for the past 40 years! Thank you to all of our German rottweiler customers over the years! Atlantahaus Rottweilers would like to thank the Good Lord and all of our many customers, both domestic and around the world, for making us one of the most successful German rottweiler show/work kennels with rottweiler puppies for sale in the United States over the past combined 40 years. Our rottweilers are truly like family to us and we take great pride in placing our rottweiler puppies in select homes. 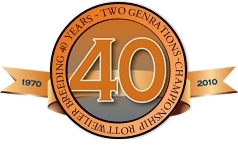 We have won many ethical breeder awards, and always try to improve the breed through careful consideration of the lineage, temperament, and confirmation strengths and weaknesses of the proposed breeding pair. We are extremely proud of the intellect, socialization, and working ability that our puppies possess, and the many testimonials and various feedback that we get from our customers and friends in the show/work/breeding circle. We are also proud to be one of the select German rottweiler kennels that other rottweiler breeders turn to for their foundation breeding stock, and for help in planning the pairings for their rottweiler kennels around the country. We believe that qualities listed above are based on our passion for the breed, which has lead to extensive knowledge of German rottweiler pedigree information as it pertains to exemplary rottweiler confirmation and temperament per the FCI and ADRK standard. This entry was posted in Rottweiler Breeder, Rottweiler Breeding. Bookmark the permalink.